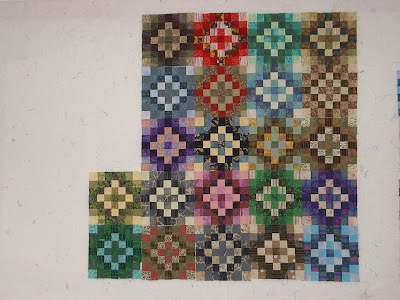 Elsie M. Campbell and Aunt Mimi's Quiltworks: Squares, squares and more squares! Squares, squares and more squares! Labor Day holiday found us lounging around at home, but I have been working and have finally finished the hand appliqued leaves for Star Crystal aka Fall Colors. I need to set the parts together later this week, but I'm going to be preparing solutions, dye concentrates, and my back yard for hand dyeing/sun printing/ marbling workshops here Friday and Saturday mornings. I purposely kept the class enrollees to only a few people because my yard is so small, and it will allow me to relax and enjoy my friends. Plus, this coming Thursday morning I have to drive to Garden City about an hour's drive from DC for a consult with the opthamologist/surgeon, and for lunch with my friend Cricket who recently moved to Garden City. In the meantime, I'm also working on some ideas for another book, Squares and Triangles. 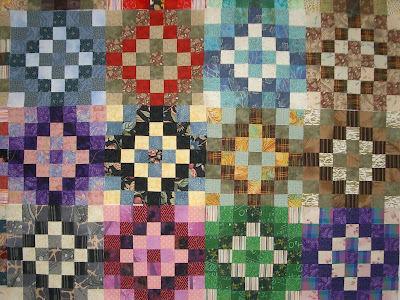 I always tell my audiences when I talk about scrap quilts, that value is more important than color. 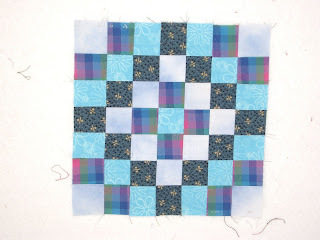 That point has been driven home with me when I began experimenting with a new block idea. I'd made a couple of drawings to begin with, and then found a whole box of 1 1/2" strips I'd cut some years ago, and decided to use them to create a postage stamp quilt. I started with one light strip, one dark strip, and two medium strips together in a sequence of 4, shown below, sliced them into sets, sewed and unsewed and sewed them back together again bargello-style to create a kind of checkerboard block. I didn't particularly care for this block. It seemed static. It just didn't hold my interest for very long. 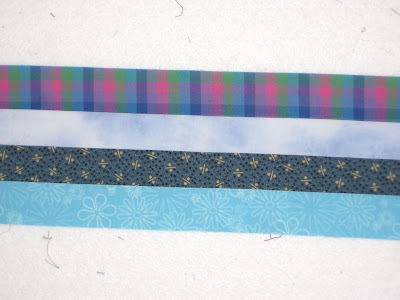 Next, I juxtaposed the two medium strips. Now, that was more like it! Look carefully at the strip sets. Only the two medium strips were interchanged. That is the only thing I changed! 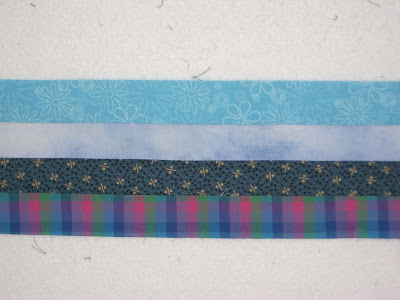 The light and dark strips remained in the same position, and I used the exact same pattern and stitching sequence. What a difference it made in the finished block! I made mistakes along the way, too. 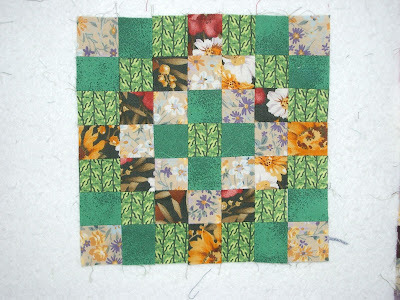 One that is easy to show you in photos is that I used a large floral print for the dark print in one block. The pattern got lost because the print, when cut up, became both dark squares, and light squares where the flower pattern was sliced up. Check out the green block below. 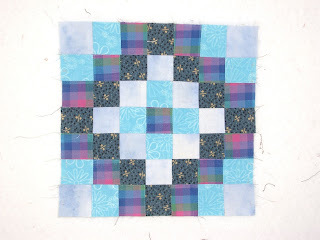 Then take a look at how the rhythm of the pattern is lost when that block is placed next to others in the quilt design. When I put a bunch of the checkerboard blocks together, I discovered that they formed a secondary design at the corners and along the sides of the blocks where a kind of ladder formed. This pattern is growing on me! I really think I like it almost as much as my first choice. 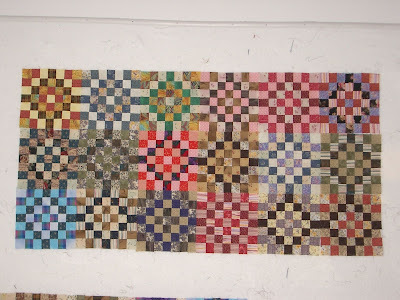 I made a bunch more of both kinds of blocks and now, I have the beginning of two quilt tops that I really like, another set of sister quilts. What do you think? Which pattern do you like best? 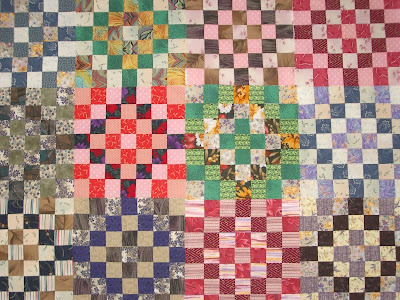 Isn't it amazing how changing one simple thing, like the position of one strip in a sequence can utterly change the entire appearance of the quilt? 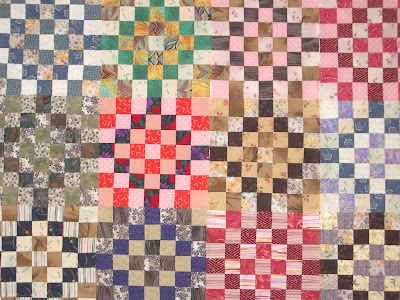 Have you found surprises like this in your quilt making? There are even more design possibilities, but theses were the two that seemed to be best.